Addressing a patient’s fears, concerns and emotional needs is just as important as achieving a good technical outcome. In fact, studies have shown that innovation on the human experience vs. customer service training, is a key driver for improved patient care and satisfaction, as well as restoring joy to the practice of medicine. Therefore, it is critical that nurses, doctors and other healthcare providers preserve human-to-human connections with patients and design new clinical standards of care that restore humanity back to healthcare. Take for example informed consent and the process of obtaining patient permission before performing surgery, administering a test, starting a treatment, or initiating other medical interventions. It is a core tenet of medicine to inform patients in a balanced way of both the potential benefits and risks of any treatment or procedure before they make a decision. Informed consent is another task on a mandated checklist that all providers must perform, yet it rarely provides an opportunity for patients to ask questions. To bridge this gap in communication and compassion, patients deserve to also receive informed hope, which gives healthcare providers an opportunity to understand the patient’s goals and discuss all the things that can go right with the procedure or treatment. Healing depends just as much on a patient’s psychological and emotional preparation as his or her physical preparation. Informed hope takes little time or effort, yet provides valuable peace of mind that has a significant impact on patient safety, experience and outcomes. According to a scientific literature review by the Center for Compassion and Altruism Research and Education at the Stanford University School of Medicine, when healthcare workers approach patients with compassion, they often heal faster and have less pain and anxiety. Additionally, patients who experience compassionate care are more likely to divulge important information to their clinicians, making diagnosis more accurate. During my career as a physician and as a healthcare navigator for family and friends, I have heard too many stories about the lack of compassion in healthcare and witnessed the impact that burnout and fatigue have on care providers. I recently heard a patient experience story that saddened me, but also inspired me to continue to lead innovations that identify processes and technologies that restore humanity and hope in medicine. After speaking at an industry conference about humanizing the healthcare experience with improved communication and empathy, I met a mother who shared her family’s story with the hope that something good would come from their experience. Her son, who was born with a congenital kidney defect, was placed on a kidney transplant list at age 16. After two years of waiting, the family got a call on Christmas Eve – they found a match! The family raced to the hospital, where they were greeted by their son’s doctor and the care team they had come to know and trust. Her son was prepped, and they were waiting nervously in the pre-operation area when the anesthesiologist, a physician he had not met before, walked in and asked that her son sign a consent form to insert a central line catheter. Her son’s eyes lit up with fear as he refused to sign the consent form and explained that he and his surgeon had agreed that the central line catheter would not be needed. As her son began to show the anesthesiologist the medical records indicating this discussion, she stopped him short, disregarding his agreement with the surgeon. Instead, she explained that the central line was a standard procedure and insisted that he sign the informed consent form. After several minutes of debate, the anesthesiologist asked him if she could insert the central line if he was about to die or if his new kidney failed. As his anxiety elevated with this discussion of all the things that could wrong, his mother escorted the anesthesiologist out of the room, and asked if there was another doctor who could provide anesthesia for the surgery instead. The anesthesiologist said no, and went on to say that if they wanted the kidney transplant, she was their only option. When the surgeon that they knew and loved arrived, her son asked him if there were other patients on the transplant list that matched the donor’s kidney. Her son told the surgeon to give the kidney to the next person on the list because he didn’t want to go into surgery with the anesthesiologist as he feared his outcome would not be good in her hands. This story is only one example of how more compassion, better healthcare communication, and a new standard like informed hope could have provided a different outcome. Although healthcare is slowly transitioning to become a more patient-centric industry, we need to accelerate the adoption of innovations that combine efficiency with empathy to drive meaningful and lasting change. In addition to behavioral skills, such as listening, touch and eye contact, enlightened hospital leaders need to infuse hope in their daily work and use proven communication solutions to restore the human connection, build trusted relationships, and improve the healthcare experience for patients, families and care teams. 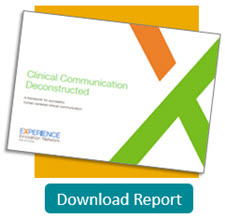 Compassion is a recurring theme throughout a recent report from the Experience Innovation Network, part of Vocera, called Clinical Communication Deconstructed: A framework for successful, human-centered clinical communication. If you’re interested in further reading on the topic of compassion in healthcare, I encourage you to download the report.